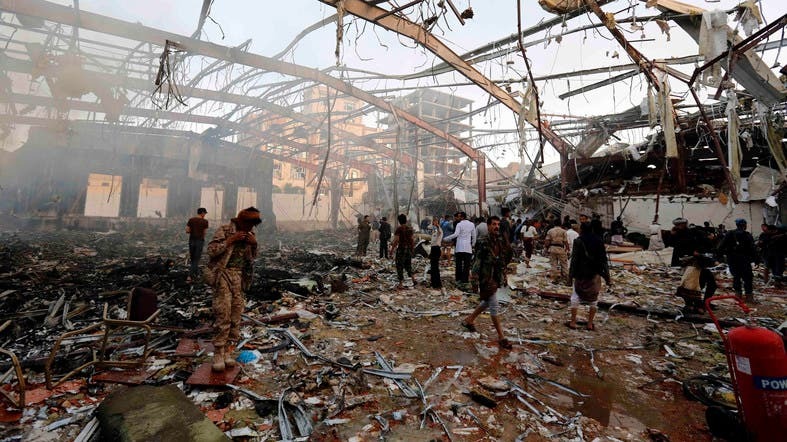 The Saudi-led coalition fighting rebels in Yemen said Sunday it is ready to investigate together with the United States an air strike on a funeral ceremony in Sanaa that killed more than 140 people. The Iran-backed Houthi militia have blamed the Arab coalition for the attack, one of the deadliest since it launched a military campaign against the Shiite insurgents in March last year. But after initially denying any responsibility, the coalition said it was ready to launch a probe into the “regrettable and painful” strike, which a UN official said also wounded more than 525 people. “The coalition will immediately investigate this case along with Joint Incidents Assessment Team in Yemen and experts from the United States who participated in previous investigations,” it said in a statement carried by the Saudi Press Agency. “The coalition is also willing to provide the investigation team with any data and information related to its military operations today, at the incident's location and the surrounding areas,” it said. The UN humanitarian coordinator in Yemen, Jamie McGoldrick, said aid workers were “shocked and outraged” by the attacks that hit a community hall in the Yemeni capital where mourners had gathered. There was no Arab coalition air role in a strike in Sanaa on Saturday, sources in the Saudi-led coalition said. "The coalition is aware of such reports and is certain that it is possible that other causes of bombing are to be considered. The coalition has in the past avoided such gatherings and (they) never been a subject of targets.